Investors from around the globe have long made substantial investments in the United States. Immigrants have come as builders U.S. infrastructure, such as, railroads, waterways, highways. Foreign investors have contributed as serial entrepreneurs in high technology, in biosciences, in health, in fitness and in wellness; and foreign investors have created other cutting edge businesses in such fields such as nanotechnologies and artificial intelligence. Name the industry or economic space and you will find foreign investors building and contributing to America’s growth specifically and to global prosperity generally. Favorite visa classifications sought by foreign investors for years have been the L Series Visa or one of the many E Series Visa Classifications. The L-1A Intracompany Transferee Executive or Manager Nonimmigrant visa category is designed for foreign investors wishing to transfer, on a temporary basis, executives and managers from their foreign affiliated offices to one of its offices or plants within the United States for the purpose of managing its U.S. investment; or for the purpose of setting-up a new affiliate, office, plant or business venture within the United States. 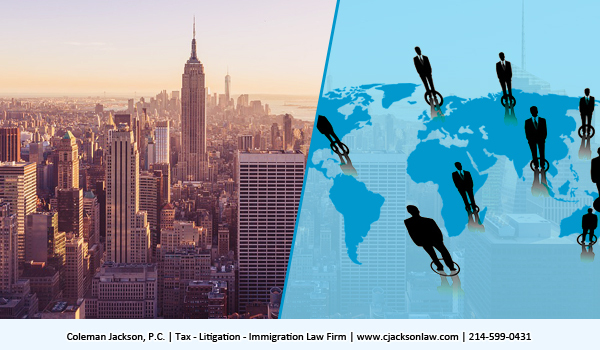 In recent years the L-1 Series Visa Classification has been a favorite nonimmigrant visa vehicle, especially when the E-Series Visa Classification were less attractive or impossible due to E-2 visa requirements. For example, the E-2 Visa requires that the nonimmigrant investor be a citizen of a country with an E1 or E2 Treaty with the United States. Many aspiring investors come from countries that do not have an investor treaty with the United States; for example, citizens of Vietnam, Brazil, and Russia; to name just a few countries of the world who are not Treaty Countries. Citizens from those countries and other none Treaty Countries might apply for an L-Series Nonimmigrant Visa if all of the specific requirements are satisfied. Further if citizens from Non-Treaty Countries can invest over one million dollars, $500,000 in economic high unemployment areas or distressed areas, they can apply for the E-5 Immigrant Visa which is designed to increase economic development in the United States by attracting foreign investors giving them an opportunity to obtain permanent residency in the United States for themselves, their wives and husband and their children under 21 years of age. The 2017 Tax Cuts and Jobs Act may have provided another incentive to spur foreigners and others to invest in new Opportunity Zones. Opportunity Zones were created by the 2017 Tax Cuts and Jobs Act under Internal Revenue Code Section 1400Z-1 and 1400Z-2. An opportunity Zone is a designated economically distressed community. The Internal Revenue Service is the U.S. Agency delegated with the authority to designate and administer the Opportunity Zone nomination and designation process under IRC 1400Z-1. Under a nomination process completed in early June 2018, the IRS designated opportunity zones in all 50 states, the District of Columbia and five U.S. territories. These designated opportunity zones maintain their status for ten years and are not subject to redetermination within the states or within DC or the five territories. A list of the Opportunity Zones can be found in IRS Notice 2018-48. State and local governments where designated Opportunity Zone communities are located cannot reassign or otherwise choose other locations within their state or municipalities to replace the designations. Designated Opportunity Zones are designed to spur economic development within these American cities and communities by giving investors within the Opportunity Zones tax credits. Investors in Opportunity Zones are not required to be from or even reside in the zones where they invest. Residence is not a requirement to qualify for the new Opportunity Zone Tax Credit. State business entity structuring laws could require residency with the State and other State specific requirements on those forming business entities or operating within their State; State business codes are different from State to State. A tax credit, unlike a tax deduction, is a dollar for dollar reduction of a taxpayer’s taxable income. Investors desiring to invest in an Opportunity Zone must timely file IRS Form 8996, Qualified Opportunity Fund. This form can be filed by any eligible Partnership, Limited Liability Company (for tax purposes LLC must be classified as a partnership or corporation), or Corporation. Investors, whether foreign or domestic, must ensure that they engage in proper business or entity structuring to classify the entity as an opportunity fund business entity. 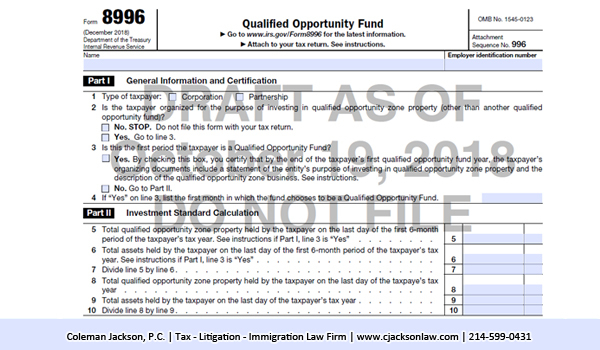 Opportunity Zone Fund requirements must be satisfied when filing organizing documents establishing the entity under State business entity laws. The mechanics or implementation of the Opportunity Zone tax incentive economic development plan of the 2017 Tax Cuts and Jobs Act are still being developed by the Internal Revenue Service who issued proposed rules and proposed regulations on October 19, 2018. 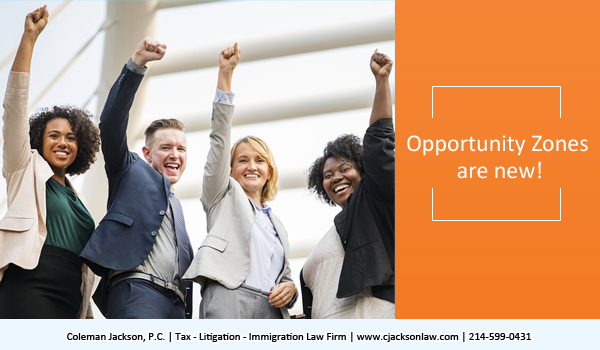 Watch our blog posts for further developments in the Opportunity Zones Tax Incentive Program and other tax and immigration topics of interest to United States citizens, permanent residents and foreign investors. This entry was posted in Business Immigration, Investors And Entrepreneurs and tagged Foreign Investors, Opportunity Zone, Tax Incentive on November 24, 2018 by Coleman Jackson.